A small port on the east coast half way between Douglas and Ramsey. The harbour was built in the mid 1800s to service the lucrative mining business but is now used by a small number of leisure craft and inshore fishing vessels. 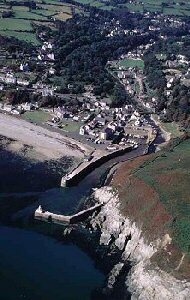 Today Laxey is largely a residential area, but during the last century it became a thriving mining village. Today, very little evidence of this is to be seen, the mines have long since closed down, but fortunately there is still preserved in all its glory the famous Laxey Wheel, said by many to be the biggest in the world. The Laxey mines, which included zinc, copper and silver as well as lead ore, were worked for many years, and in the later half of the nineteenth century were very prosperous. They extended to a depth of around 1800ft.